You are at:Home»Posts Tagged "pet health problems"
If you are a smoker and love your dog, there is one VERY important thing you can do to save Toto’s life and yours too: quit smoking. A growing body of research – including the Surgeon General’s Report – shows there are no safe levels of exposure to secondhand smoke – for humans and for animals. An estimated 50,000 Americans lose their lives to secondhand smoke (“SHS”) annually and 4 million youth (16 percent) are exposed to secondhand smoke in their homes. A number of studies have indicated that animals, too, face health risks when exposed to the toxins in secondhand smoke, from respiratory problems to allergies and even cancer. Cats and Dogs and Parasites oh my!! How can you recognize feline Urinary Tract Infections early on, to save your kitty needless pain, and damage to your home from her cat urine? 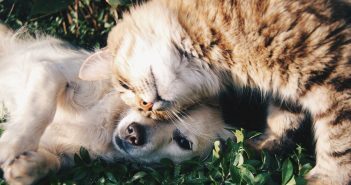 This article will outline the steps you can take to prevent kitty’s pain from feline Urinary Tract Infection and the damage done to your home from her urine.